I've talked about PreCure thrice before. I started by talking about DokiDoki and then I moved back to Futari Wa and Max Heart. With the films, I'm going to start at the beginning. Unfortunately, there were no Futari wa films. Which means skipping ahead to the entirely mediocre sequel, Max Heart. Well, maybe the film will be more about Honoka & Nagisa and less about... what was the boring one's name? Inori? Yeah, that sounds right. We open with Nagisa and Honoka sitting at Akane's takoyaki stand. They converse with Akane and one another. The other girl... Setsuna is given her break and the three run off. They're approached by a mysterious cloaked figure who sounds just like Goku and knows they're PreCure. After a brief battle, it's revealed that the cloaked figure was actually a bunch of little frog warriors from the Garden of Hope. They request assistance from our heroines as they're being threatened by a powerful witch. Not wanting to abandon those in need, Honka, Nagisa and the other one agree and they're teleported to the Garden of Hope. The only story issue that really merits mention is with the ending. Things wrap up really easily in the end. On one hand, you can forgive it somewhat since this is a franchise for the youth. But, on the other hand, it isn't as satisfying a conclusion as it could have been. There are a lot of things to like about the film. It's paced very well, flowing from one thing to the next very naturally. The conflict has weight to it. The arc of them gaining the friendship of the warriors is nice. There's also very little of either Pollun or Tsubomi. He might have four or five lines, and she mostly stays relegated to the background or is just out of the fighting due to being Yamcha'd. Honestly, the series proper could have benefited if they'd gone the route of the film and had significantly less of those two. The characters are pretty much the same as they are in the series. Nagisa and Honoka are fantastic and have a strong dynamic. Erika is really flat and boring. Pollun is a bit less annoying here. Mainly because he's used a lot less and he doesn't throw any tantrums. In terms of new characters we get for the film, they vary. Most of them are just kind of flat. The big exceptions are Square and Round, who are a bit more fleshed out and Marquis, who's a little annoying. Our antagonist is one of those villains who only trusts in her own power and mocks the heroes for relying on others. Pretty standard, but there's nothing really wrong with her. I have to give the film credit on this count. While the designs are the same as the series (including Itsuki's perpetual look of dull surprise), or on par with it in the cases of the film characters, the backgrounds in this are superb. At least, they are when we get to the Garden of Hope. It is a very pretty world. I also do like the antagonist's design and her bat-like minions. What they do with her ship is really cool. The action sequences are really good as well. Nagisa & Honoka really get physical with the punches and kicks. We also get to see their frog-like compatriots punch some bat monsters. Which is pretty awesome. Honna Youko and Yukana deliver the superlative performances we've gotten used to in this franchise. I'll also give credit to Nozawa Masako & Matsuoka Youko. They're both good in this. Ikezawa Haruna's performance is much less annoying, probably because of her character being downplayed. Tanaka Rie still sounds like she's just not putting in any effort. I'm still certain it's because Yuri has all the emotional depth of a paper clip. I mean, she displayed emotions as Aizawa Chizuru, Nishizumi Maho, Sei and Neptune. The music is pretty much like the music from the series proper. Right down to using the lazy remix theme tune. Which shouldn't be a surprise considering that Sato Naoki did composition for this, the series proper and Futari wa. Most of the music is good. We even get some new songs that are quite good. Unlike the main Max Heart series, in this film Honoka and Nagisa are allowed to have moments without them being interrupted by Hibiki. And they manage quite a few. Including one early on where Nagisa says she'll find someone who likes her for who she is and it's promptly followed by Honoka saying she's cute. So, that's Futari wa PreCure Max Heart The Film. Surprisingly, given my general thoughts on Max Heart, I quite liked it. It's got a lot of charm. Keeping the boring and annoying characters largely to the side was smart. The action is pretty amazing. The artwork in general is pretty, actually. All in all, I give it a 7/10. If you're a fan of Futari wa PreCure, give it a try. Even if you're like me and don't have any affection for its sequel. Tomorrow we'll keep film festival week going with Kaze Tachinu. The time to watch the first movie of this fantastic franchise finally arrived... and it was decent. 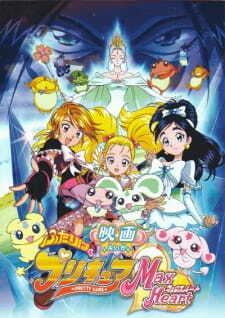 The story is pretty standard for those type of movies (or well, in the case of Precure it's more or less what it's about, just in shorter duration): some magical frogs come to ask the Precure and Hikari for help to face a baddie who wants to steal a treasure that they have which would cause chaos in the wrong hands, and it's up to them to save the day. The characters from this movie were fairly forgettable excluding Square, one of the frogs who is way less open to the Precure than the rest and creates some drama for Nagisa due to his opinions, he developed pretty well over the duration of the movie to be satisfied with him. In terms of art and music it was more or less like the TV series, which is a good thing because the action scenes were very enjoyable to watch as usual thanks to the nice animation, there is also a solid insert song in the movie that I liked, no complaints from this part. Overall this movie was pretty unremarkable but not boring to watch, I would recommend it if you liked the TV series, but if not it's definitely skippable.